Father’s Day slideshows express your feelings about family! Father’s Day slideshows give you a way to describe how you feel about dad without getting all mushy. A picture is worth a thousand words, so let a Father's Day slideshow do the talking for you. Just imagine all the things that you can tell your dad with a free Father’s Day slideshow that’s loaded with your favorite photos of him! Father’s Day slideshow maker from Smilebox captures all the reasons why you love your dad. You can load your Father’s Day slideshow with pictures from your computer, phone, and social media accounts, so you can be sure that all the parts of his personality will shine through. Your slideshow for dad can then be personalized to really refine your message. Smilebox Father’s Day slideshow maker gives you lots of color, text, and font choices, and makes them easy to change. 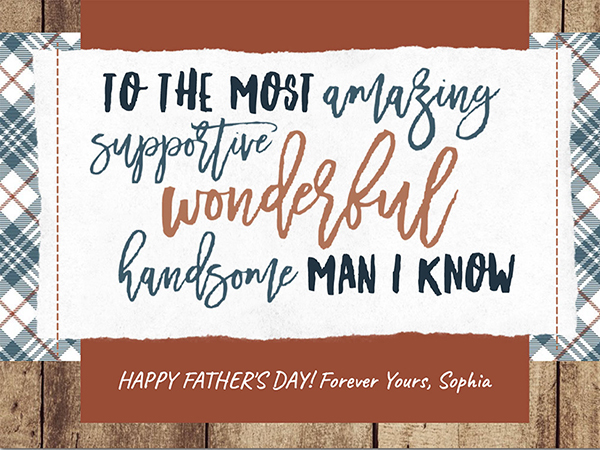 Within just a few minutes, you can create a superb Father’s Day slideshow that matches his style and is ready for viewing. Find out just how easy it is to create a free Father’s Day slideshow. From goofy to gruff, every dad has his own style, and we’ve got a Father's Day slideshow template to match. Pick one that fits him best, and then click “Personalize”. Now it’s time to click “Add More Photos” and go through all the photo collections on your phone, social media, and computer. Don’t forget to add your dad’s favorite song. If you’ve uploaded a lot of material, you can save time with the “Autofill” feature, which automatically places pictures on your Father’s Day slideshow for you. You can do this manually as well. Father’s Day slideshow maker comes with a whole load of customization options. Choose from a wide range of colors, texts, and fonts to make your Father’s Day slideshow exactly what you want. When you make a change, it’s easy to see how it looks – just use the “Preview & Share” tool to immediately view the updated version. Alternately, at the bottom of the screen, there is a miniature Father’s Day slideshow running that shows all the details. If dad is comfortable using email and social media, you can use them to deliver your Father’s Day slideshow. But if you would rather show your creation in person and enjoy his reaction, then just save your Father’s Day slideshow to your computer to display it. Father’s Day slideshows are a great way to record some of your most cherished shared memories. Every time you make a slideshow for dad, you’re creating a way to organize and store images of the things you have done together. In later years, you can look back on all the Father’s Day photo slideshows that you have made and relive many of the moments that you remember fondly. What’s more, you can share these times with the whole family by sending your Father’s Day slideshow to loved ones. Father’s Day slideshow maker is easy to use and creates an impressive, personalized memento. But it also serves as a great activity for the day. Tell everyone to bring their gifts while you show a Father’s Day slideshow that everyone will love, and enjoy the laughs and tears. It could just be that making a slideshow for dad becomes a permanent part of your Father’s Day ritual.